Already using Google+? Follow Mashable’s Pete Cashmore for the latest about the platform’s new features, tips and tricks as well as social media and technology updates. Unlike Facebook and Twitter, Google+ doesn’t offer vanity URLs for user profiles, making it more difficult to share your Google+ Profile with your friends. Instead, Google uses a long string of numbers to denote users (e.g. 117691391504351341685). Of course, this leads to a problem: you don’t want to be telling people to type in a long string of numbers to find your Google+ Profile. That’s where Gplus.to comes in. This simple little app lets you create a short URL for your Google+ page, making it easy to share with your friends. Mine, for example, is Gplus.to/benparr, which is much easier to remember than a random strong of numbers. 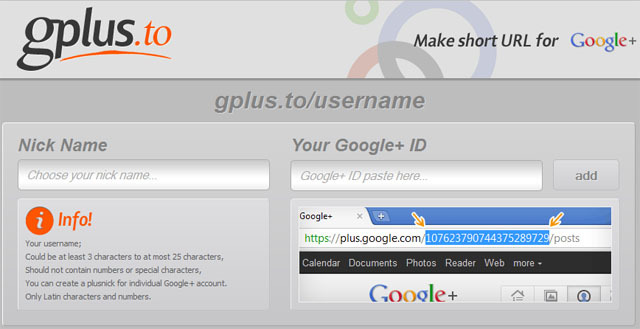 Gplus.to fills a gap that Google+ doesn’t currently address. Should Google give users the ability to create vanity URLs, or is it too much of a privacy concern because of its connection to Gmail? Feel free to let us know in the comments. This is the Google+ logo. The Google+ icons. Starting top left and circling to the right: Circles, Hangouts, Home, Sparks, Profile, Photos. All Google sites will sport the new Google+ navigation bar. It includes notifications, profile information and content sharing options. This is the Google+ Stream, where users share content and see what their friends are sharing. It is similar to the Facebook News Feed. Google+ Circles is Google's version of the Facebook friend list or the Twitter List. Users can select multiple friends and drag-and-drop them into groups. This makes it easier to send stuff to friends, family or the entire world. This is the Google+ Circles editor in action. Google has created unique animations for adding and removing friends through HTML5. Google+ Sparks is Google's content recommendation and discovery engine. Users can search different topics and find relevant articles, videos and photos. Users can then share that content with their friends. Google+ has a unique video chat feature called Hangouts, which lets you chat with up to 10 people at the ame time. 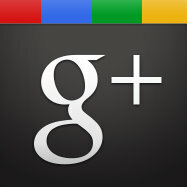 Google+ allows you to upload and share photos with your friends. It includes photo tagging and a simple browser-based image editor. Google+ Profiles are like most profile pages -- it includes basic information about the user like interests, occupation and profile photos.